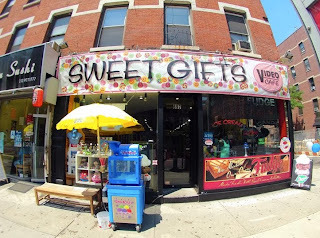 A couple of readers have written in to let us know about the closure of Sweet Gifts at Video Cafe on 9th Avenue and 48th Street in Hell's Kitchen. On their Facebook page, and in a note on the door, Sweet Gifts writes: "To our extended Family that have supported us for the past 20 years. We are sorry to inform you that we can no longer serve our beloved Community. It breaks our hearts to have to say these words, but as you can see from the changes to our Community and rising rents, we can no longer continue our operations. We thank you for your support, kindness and memories that will remain in our hearts forever." Reader David M. writes: "This one hits hard for us as it's our neighborhood and we go there a lot after school with my kid. 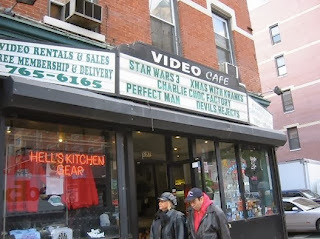 They were an old local video store that still rented DVDs and blu rays, but had tried to adapt in the past decade by adding candy, clothes, and toys. Everyone working there looked really sad and people coming inside seemed really heartbroken about the closure. The rent is just going too high." Reader Roy S. says, "So sad to see this family-owned business going under. As a Hell's Kitchen resident for 20-some years, this store has been where I rented movies, bought candy, and chatted with the owners. If they didn't have it, they'd get it for you. Another victim of skyrocketing rents. I'm not sure how long they can hang on. Could you give them a little publicity and help them sell off their stock?" Sweet Gifts' DVDs are currently on sale.